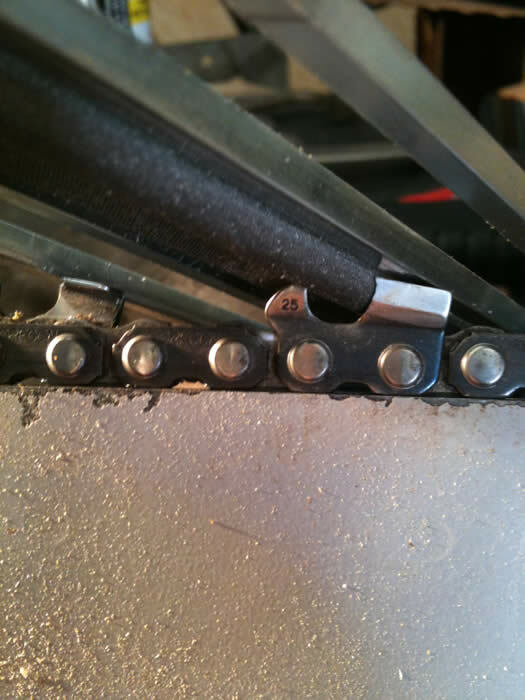 For many, many chains I have been using the PFERD ChainSharp tool for sharpening and damage repair of my saw chains. Every workshop I discuss the design of Oregon® saw chain and how the sharpening tools work to re-establish the five parts of the saw's cutter teeth. The five areas are: Depth gauge, Point, Side, Top and Chisel (www.forestapps.com/tips/chaintoth/chain.htm). The PFERD ChainSharp has proven to work well and to speed up the task of sharpening a saw chain by doing two steps at once. It resets the depth gauge of the tooth as you file the cutter radius. 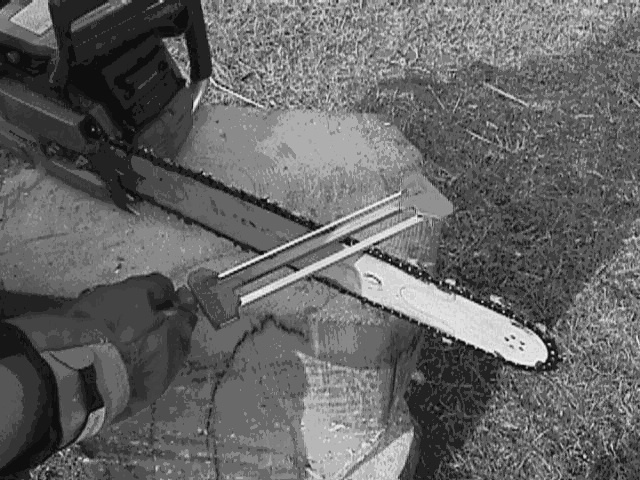 Much faster, and in my opinion, does a great job of keeping your chain saw cutting at proper speed while maintaining safety. The ChainSharp consists of a framework that houses a round file and a flat file. The round file cuts the inside radius of the tooth and the flat file adjusts the depth gauge (sometimes called the Raker). The holder rails are supported or indexed on the tops of two cutter teeth. This keeps the round file at proper height in the cutter radius. The depth gauge is set by the flat file in relationship to the height of the point. As the tooth length is shortened and the tooth point declines in height, the flat file is lowered on to the depth gauge. In effect each tooth's depth gauge is set independently offering a very consistent and smooth feed into the wood. One technique I use to remove damage to a chain is using a flat file before actually sharpening. This technique offers a great start to re-establishing tooth face and radius. With the ChainSharp you can easily clean up of the tooth with the center of the round file by holding the tool up slightly from the indexing tooth, then return it to the normal position as you continue sharpening. Sharpening is not complete until all damage is removed and the five tooth parts are all correct. It is always best to keep every cutter even in length for maximum chain life. However, this is not always possible in the field. One amazing feature of the PFERD tool is that it keeps every tooth taking the same chip thickness (bite) as long as the variance in tooth length is not too great. Introduced recently is the ChainSharp CS-X. 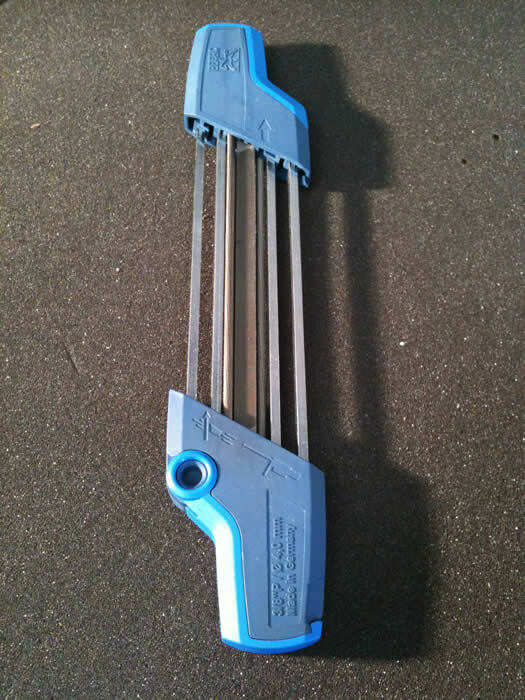 A new design of the tool that incorporates two round files and replaces the need to remove and flip files to change filing directions. The tool is a bit larger and heavier but it grips well in your hand and feels much more stabile as you push it through the sharpening process. 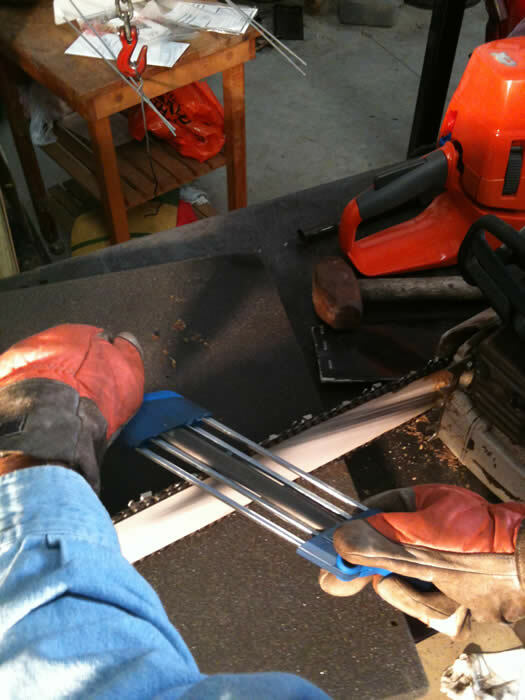 Place the chain saw into a sturdy bench vise or a PFERD File Vise. Hold the ChainSharp tool with the proper picture indicators of the left or right cutters and the shown position of the chain saw. The tool should also be held at 90 degrees to the guide bar. The existing tooth top angle should be followed or use the 30-degree reference angle built in to the ChainSharp handle design. Push the file forward following the arrow indicator, with light pressure applied back toward (into) the cutter tooth radius. Do not apply heavy pressure downward. Allow the tool to rest on the tops of the cutter teeth, no need to apply heavy downward force. Check the five tooth parts and your progress frequently on each tooth. Once the five tooth parts are correct and sharpened, move to the next cutter in the loop. Once all cutters are complete on one side of the chain loop, turn the saw around, and the tool over, to accomplish the same on the other side. I find it best to always move your chain forward on top of the guide bar. This reduces the chance of cutting yourself (gloves should be worn) and also keeps your chain saw oiler drive gear engaged. Make it a point to sharpen the chain cutters in the same approximate location on the top of the guide bar to maintain a consistent filing position and results. I was a little skeptical of the CS-X version at first but after filing an Oregon® 72LG chain back to the top witness mark, taking it out to a large Red Oak log and sinking it in, I now have to say I’m impressed. The CS-X is much more rigid than the standard tool and is easier to guide through the file process. It’s possible to quickly dress damaged points and top plates by simply lifting the back rail of the tool and making a couple strokes with the middle radius of the round file. Then lower it back down to finish the radius of the cutter and set the depth gauge. File plugging with the spiral cut PFERD file doesn’t create much of a problem, as they tend to clean themselves with just forward movement. However, it is still possible to turn the file to keep file teeth clean should it be necessary. It requires removing the file slightly through the end cap turning it and returning it to action. The original version you can twist as you file. Filing the entire saw chain all the way back I really didn’t see this as a problem. The tool comes in 5/32, 3/16, 13/64 and 7/32 versions. These versions are a little more chain pitch specific than the standard tool. The spread of the support rails are different in placement to meet the tooth types- a little more specifically. Meaning you have to have the proper size tool for .325” pitch chain. Low profile .325 chain versions took the 5/32 and full profile the 3/16 version. The files on any ChainSharp tool can be easily replaced. The original tool and the new CS-X uses standard file length sizes and can be replaced by opening the end of the tool handle. The flat files are special and are available as replacement parts, however you will find them to last a very long time. Note: The 7/32 file tool shows for .404", this is for .404" full profile saw chain only. 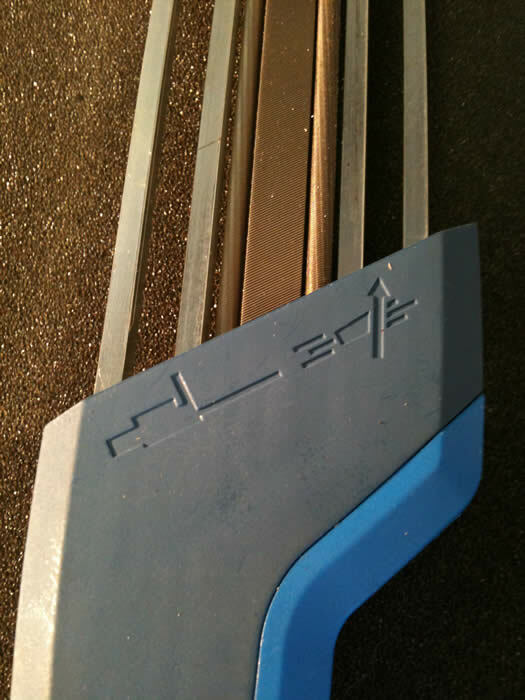 The 3/8 tool is for the full profile 3/8" and uses a 13/64" file. The .404" tool will not position correctly on 3/8" chain. Remember: Always wear gloves and safety glasses when sharpening and working with saw chain. The ChainSharp continues to be one of the best tools for your “in field” sharpening in my book. The CS-X is around $45 if you want the latest design but the standard versions will continue at under $25. If you want to keep your saw chain in top condition I recommend the PFERD ChainSharp highly as one of your toolbox items!